November | 2012 | What Can I Say ? As most of you know, one of my gainful gigs involves working with owner Anne Jones and staffers Donna, Mary, Shirley and Laura at The Black Sheep Needlepoint Shop on 17-92 in the Virginia Mills District of Orlando. It’s a great gig, a fun gig– I handle their eCommerce sales and assist in the shop when needed; e.g., on Thursdays when it is time to decant the large, full garbage bag into the dumpster, I am elected. Or if it’s opening time and therefore the moment to bring our mascotress Woolamena outside, I’m the guy. Other than that, I’m ensconced in the Rear Annex, quietly listing and selling and packing and shipping our wares. Today, however, was an extra special treat. 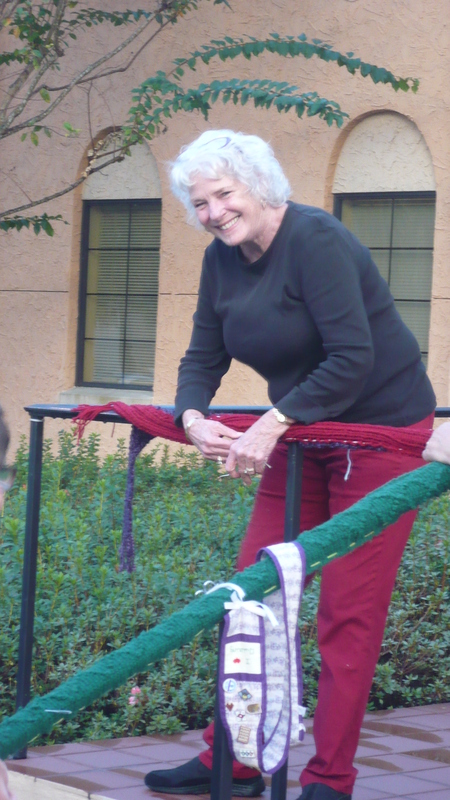 I was entreated to come up front (unshaven, wrinkled) and pose for pre-event photographs which Rollins College photographer Scott was needing to shoot prior to a yarn bombing which The Black Sheep was going to be involved in later that day. 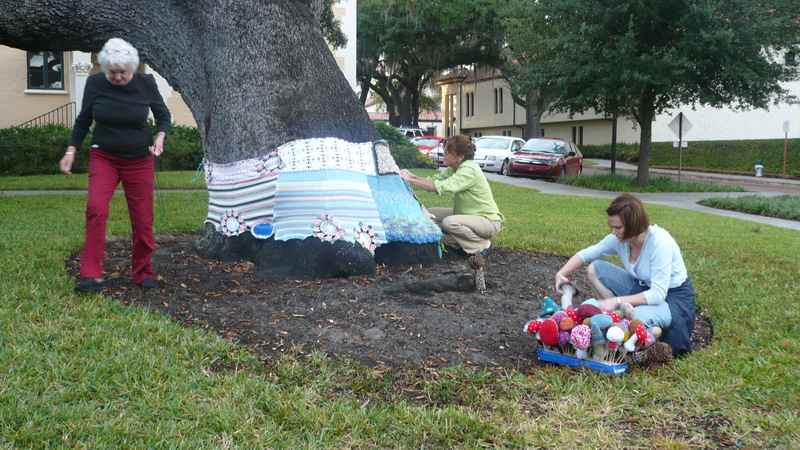 Even though, at that point, I hadn’t been expecting to touch any yarn, let alone do any bombing, I gamely sat at the table with Donna and Mary and allowed myself to be photographed as if I were a vital part of stitching together the crocheted and knitted panels that were going to be wrapped around trees at Rollins College. If you know me well enough, you are telling yourself right now that you can’t just believe that I would sit there idly posing with a needle and not actually be doing any work. And I actually did: I whip-stitched my way along numerous panels and then, when a needlework class began arriving at the shop for a 1 PM tutorial and needed our work table, I hied myself to the Rear Annex so that I could stitch at a table which had enough room for me and my panels. I now know what Betsy Ross must have felt like while the revolution was going on around her. She probably sat alone in a stifling attic, sweating through her farthingale, stitching together the banner for what were then known as The Thirteen Original States. Ask yourself: was she looking forward to a Fourteenth state? Who knew? 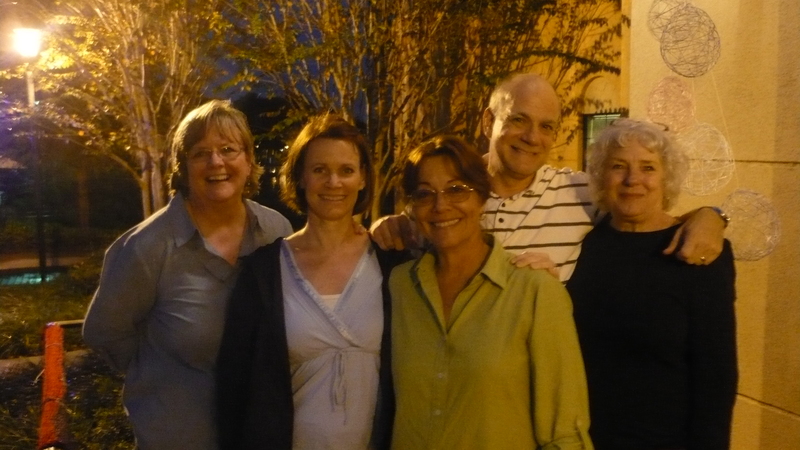 Anne, Laura, Donna, Jim and Mary. But I digress. 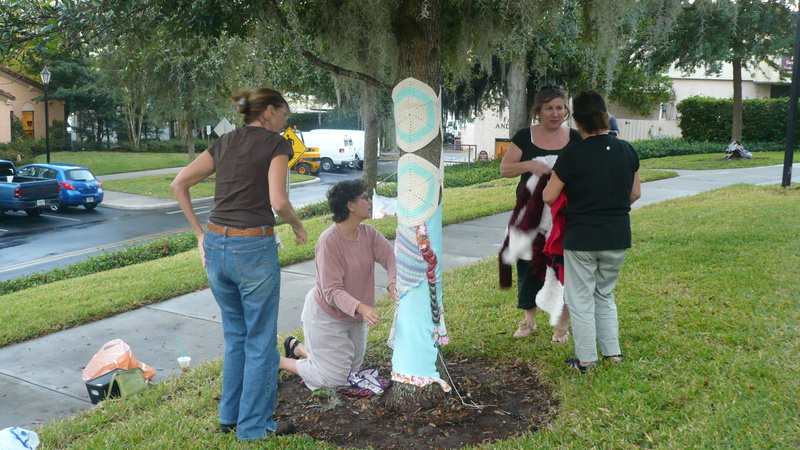 When we were done stitching together our panels of assorted projects which had been donated, The Black Sheep contingent drove to Rollins in Anne’s truck, which she actually spoke to while driving, by the way– and it answered her. Politely. It even made phone calls for her! If I even ask my car– BEG it– to make a right turn, I am given grief and an eventual argument, neither of which help when I’m trying to blend onto the East-West Expressway from Semoran Boulevard. 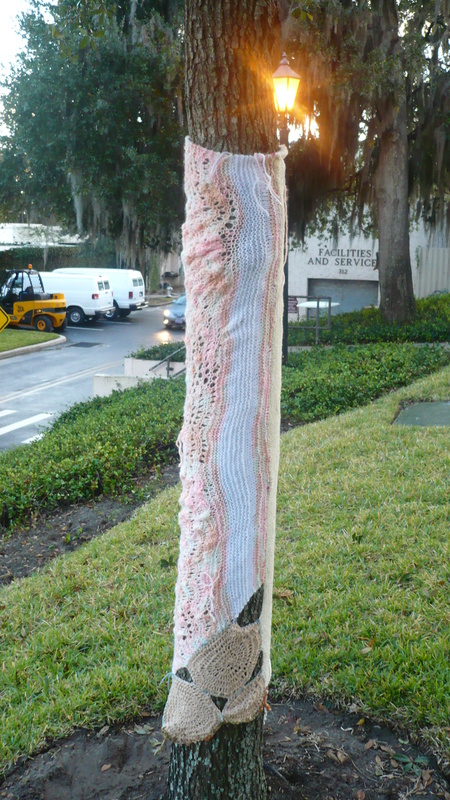 We attracted a lot of attention as we stitched away at Rollins, and the slowly setting sun gave our yarns myriad hues and textures as the light changed. It was magical. The weather was perfect this evening– it had rained an hour or so ago, and the air was cool and crisp and verdant. You could smell the grass under the trees we were bombing, every step sending up a puff of green. 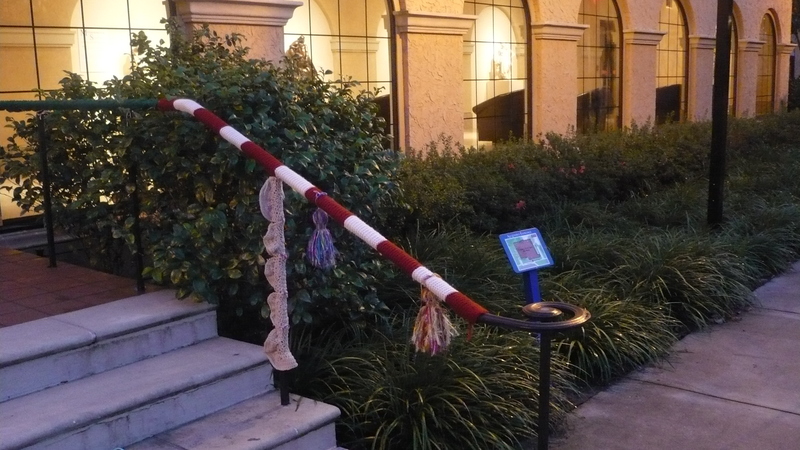 Rollins is hosting an installation at its Cornell Museum called The Mysterious Content of Softness, featuring exhibits by many talented fiber artists. It’s amazing and provocative and, though I normally hate the overused adjective “amazing,” in this instance it fits. The exhibits are jaw dropping and inspirational. You should go. 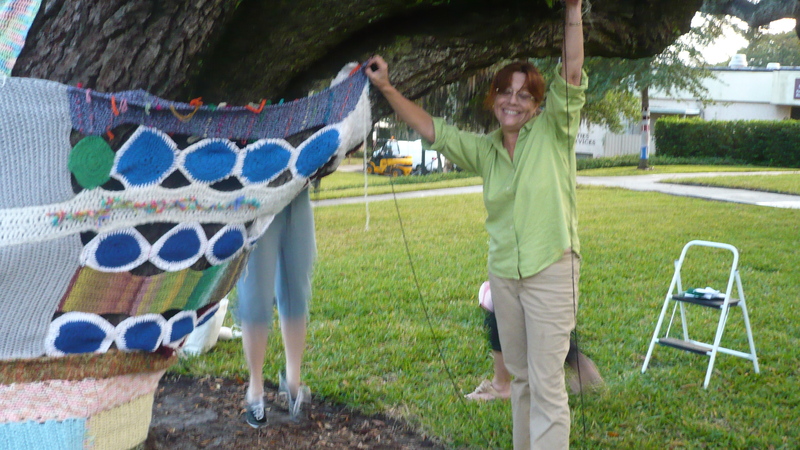 This was a very special day– a nice blend of nature, fiber arts, good people, great weather, and a chance to invade Rollins College. The installation will be there for you to enjoy for a short time, so get down there and see what’s up. You might even be creatively inspired… and who knows? 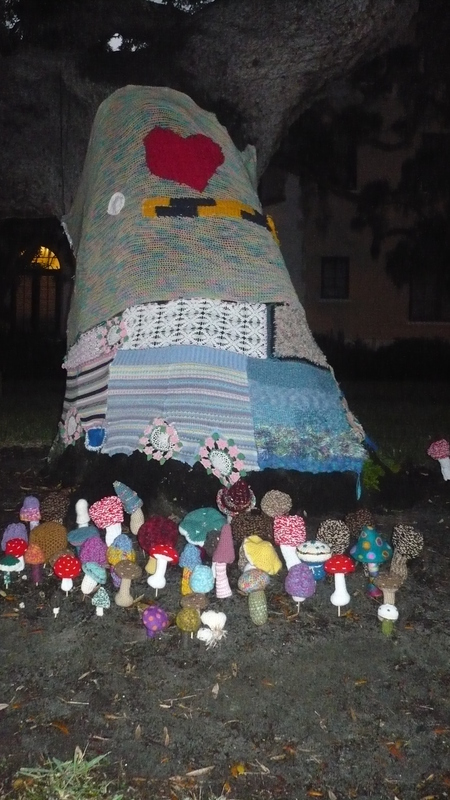 Maybe we’ll invite you to help us yarn bomb the Brooklyn Bridge!